On 5 March 2014, upon his arrival to Istanbul, His Holiness Patriarch Kirill of Moscow and All Russia headed for the Patriarchate of Constantinople where he met with His Holiness Patriarch Bartholomew. 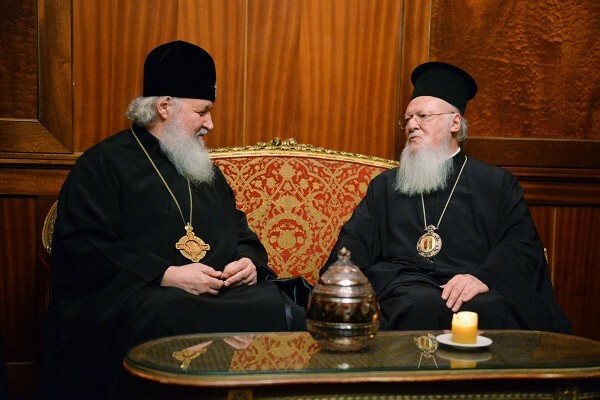 His Holiness Patriarch Bartholomew of Constantinople warmly greeted the Primate of the Russian Church and his suite and expressed his joy over the participation of Patriarch Kirill in the meeting (synaxis) of the Primates and representatives of the Local Orthodox Churches. Patriarch Bartholomew said he understands what regret the Moscow flock feels due to the departure of the Bishop of Moscow, noting, at the same time, that the forthcoming meeting of the Primates of the Local Orthodox Churches will contribute to the unity of the Church. During the fraternal meeting, the Patriarchs discussed various issues. According to the Orthodox Lenten tradition, Patriarch Bartholomew and Patriarch Kirill asked each other for forgiveness and for prayers. Taking part in the meeting were also Metropolitan Hilarion of Volokolamsk, chairman of the Moscow Patriarchate’s Department for External Church Relations; Bishop Sergiy of Solnechnogorsk, head of the Moscow Patriarchate’s Administrative Secretariat; and other members of the delegation accompanying His Holiness Patriarch Kirill on his visit. Representing the Patriarchate of Constantinople were Metropolitan John of Pergamon, Metropolitan Emmanuel of France, and Archimandrite Bartholomew (Samaras), Chief Secretary of the Holy Synod.